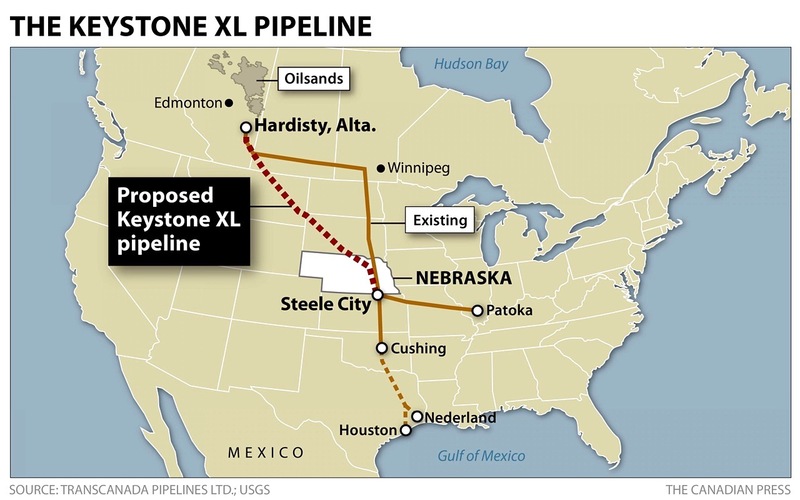 Image above: Map showing route of Keystone XL Pipeline. From original article. Click to enlarge. It is now official, Trump has signed executives orders to advance the construction of the controversial Keystone XL and Dakota Access pipelines, according to which the US will renegotiate terms on the two pipelines. As part of the announcement Trump said "if the US build pipelines, the pipes shoudl be made in the US" and added that "order streamlines cumbersome manufacturing regulations." He called the regulatory process a "tangled up mess." Trump told reporters in the Oval Office that the moves on the pipelines will be subject to the terms and conditions being renegotiated by the U.S.
President Barack Obama killed the proposed Keystone XL pipeline in late 2015, saying it would hurt American efforts to reach a global climate change deal. The pipeline would run from Canada to U.S. refineries in the Gulf Coast. The U.S. government needs to approve the pipeline because it crossed the border. The Army Corps of Engineers decided last year to explore alternate routes for the Dakota pipeline after the Standing Rock Sioux tribe and its supporters said the pipeline threatened1 drinking water and Native American cultural sites.